Wire Terminal Blocks are manufactured from Brass, Copper, Aluminium, Polyamide, Polymer, Stainless Steel or any type of material as per custom specification. The standard range of Wire terminal blocks are available in varied types including crimp wire terminal blocks, spade wire terminals blocks, specialty wire terminal blocks and more. They are available in horizontal and vertical wiring structures. Wire Terminal Blocks are available with different types of coating and finish including chrome plated, electrolytic tin, nickle plated brass, zinc, copper and more as per custom specification and requirements. Minimal space requirements enable high wiring density. Available in different wire terminal configuration. Available with high electrical conductivity. Corrosion Resistance, Vibration Resistance, Impact Resistance and Abrasion Resistance. Provide permanent and secure connections. Wire Terminal Blocks provide protection from short circuits and eliminate splicing between connectors. 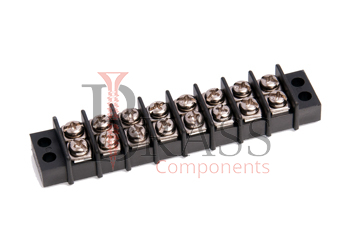 Pluggable versions of Wire Terminal Blocks are also available. Wire Terminal Blocks are used to specify wire gauge installation. Secure mounting, installation and connection. Widely used in instrumentation, power supply, telecommunication and other electrical industrial applications. Applicable for high current connections and installations. Ideal for space saving electrical installation. We manufacture Wire Terminal Blocks as per Custom Specification and export in Finland, Jersey, Spain, Switzerland, Ukraine, Austria and other European Countries. For more Information, Please Contact Us or Inquiry Now.